CONNECTOR SLEEVES - Heavy Duty - These new heavy duty connector sleeves are American-Made from brass with a black oxidized finish. They work great for making leaders and rigs, especially for salt water fishing! 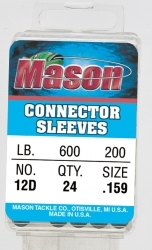 The sleeves are available in an assortment of sizes to fit all of Mason's Multistrand Wire, Nylostrand Wire, "49" Strand Wire and Monofilament line.